Bondora was able to recover more missed loan payments than previous months, a testament to our dedication to tracking down missed peer-to-peer loan payments. While defaults are expected and always accounted for within our risk ratings, we still do everything we can to limit missed payments from our borrowers. The largest increase in recoveries on the month came from working with local bailiffs to track down missed payments. Total recoveries in the bailiff stage of recovery came in at 9,431, 4.2% higher than in January. Recoveries in Estonia and Spain were relatively stable on the month, while there were 498 more cases in recovery in Finland, a 6.3% increase over the previous month. All told, less money was collected in recoveries in February. 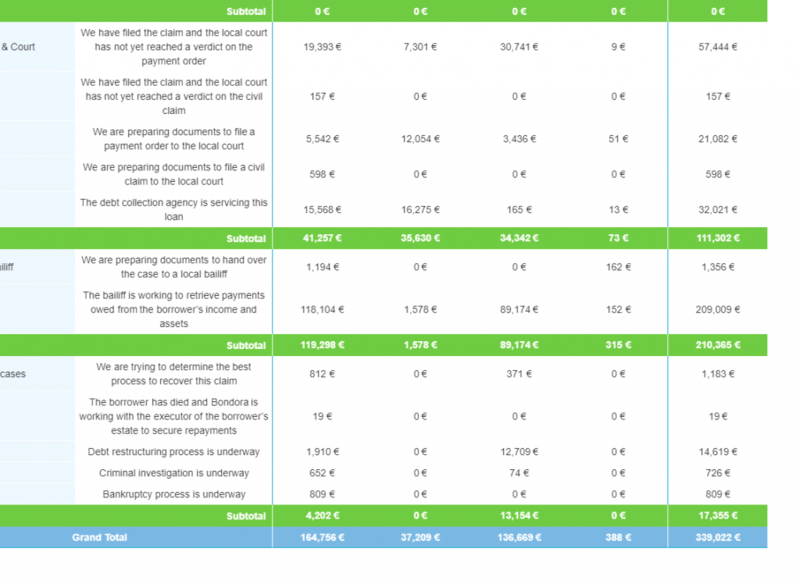 A total of €330,022 was collected over the month, a slight decrease of 4.6%. 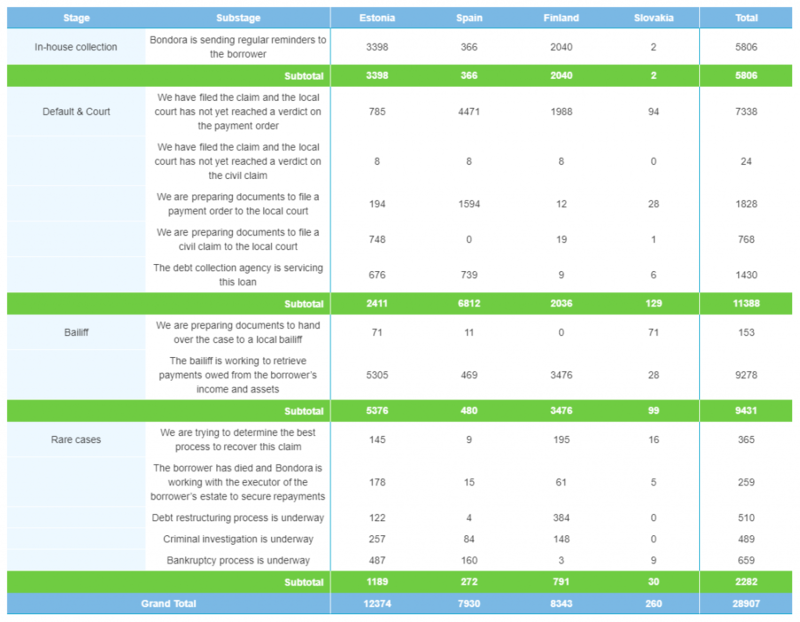 Interestingly, even as there was an increase in the recovery count of bailiff stage recoveries, the missed payments collected in that same category decreased by 11.6%, down to €210,365. This means the average missed payment recovered was less in February than in January. The majority of this decrease was seen in recoveries from Estonia, which totalled €192,740 in January and dropped to €164,756 this month, a decrease of 14.5%. 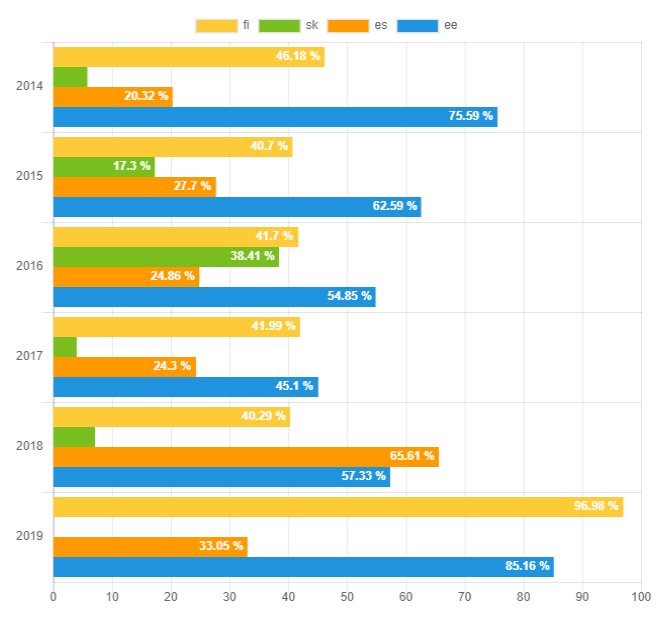 While you might expect the recovery rate for this calendar year to continue to decrease as the year progressed, recoveries for missed payments in 2019 increased in February. The recovery rate this month was up to 85.31% from 79.74% a month prior. Now, the total recovery rate for the past six years increased to 51.26% as compared to 50.98% in January. 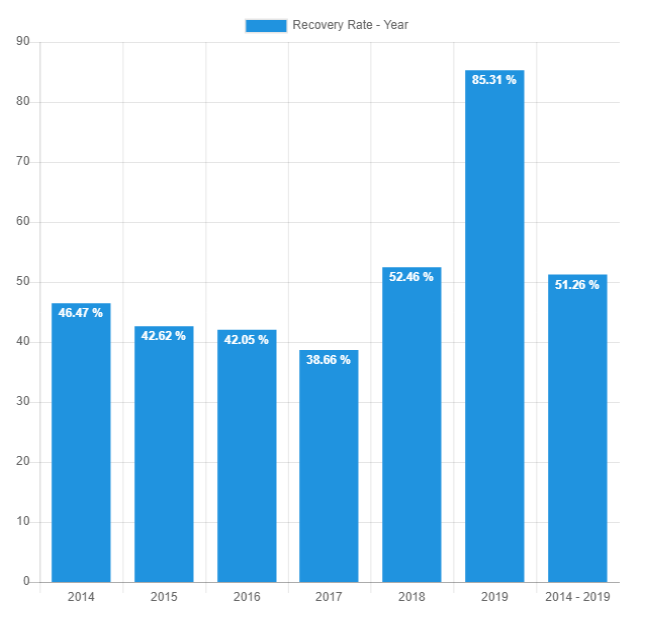 The increase in the 2019 total recovery rate can be directly attributed to recoveries in Finland, where the recovery rate increased from 63.25% to 96.98%, boosting the overall recovery rate for Bondora loans on the month. Recovery rates in historical years remained relatively stable, plus or minus 5% in most cases. For peer-to-peer lending investors, missed payments are nothing to be afraid of. That is, as long as missed payments are vigilantly tracked and accounted for at the most detailed level. As risk and defaults are two separate things. This requires a team of people hard at work in missed payment recoveries, and credit analytics. This is why at Bondora, not only have we created an optimized process for recovering missed payments – additionally, we are completely transparent with our successes and failures, as we track all data and information for our investors to view in real-time. Check out our real-time statistics to see not only recovery data on all Bondora missed payments, but loan history, return data, and more.